It's a new day, a new week and a new month. Focus for today? The market veggie produce I picked up and what to do with it without killing it's natural flavour. I have noticed that many people seem to harbour an aversion to root vegetables (other than carrots), and perhaps that would be an aversion I shared if I thought the only way to cook such a vegetable was to boil it. But nay - the secret with these hardy veg is to intensify their natural flavours (which are actually sweet, not bitter). Best way to do that? Roast them! 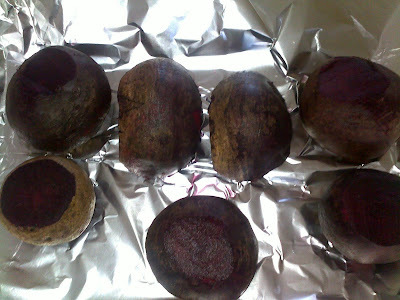 While the oven is pre-heating to around 180 degrees Celsius, scrub your beetroots (the skins do slip right off after roasting though, for those who don't like the texture), top 'n tail them and line them up on a baking sheet/roasting tray wrapped in tin foil. Roast for around 60 - 90 minutes, until nicely tender but still al dente when poked with a knife. While the beets are roasting, pan fry some chicken breasts in a drizzle of olive oil, salt and pepper over low - medium heat. Make some basil pesto by zoeshing together olive oil, fresh basil, garlic, pine nuts, parmesan/pecorino, salt and pepper. 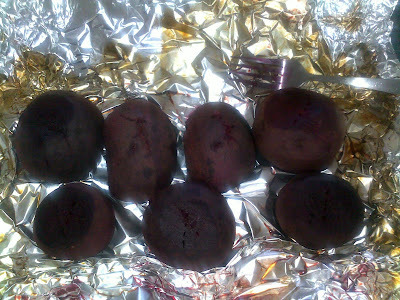 Let your roasted beets cool a little bit, then toss with olive oil, balsamic vinegar, salt and pepper. 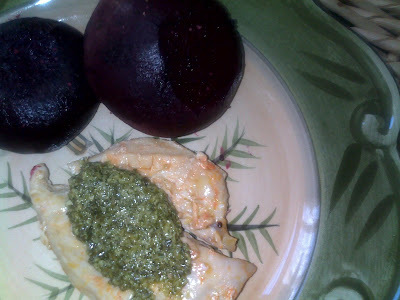 Serve with a tender chicken breast topped with basil pesto.